here are a couple of videos bryan and i captured this morning of his latest sound chips, the class 03 shunter and GWR castle. The 'Castle' sounds 'not too bad' - best I've heard yet of a GW 4 cylinder loco. Incidentally it sounds as if the large ejector is being put on (when it should be put on) but there seems to be no separate F key for it? The sounds are good and the video is lovely and clear. The only change I'd suggest is to the video aspect ration as they are currently coming out tall and thin - please don't take that as a criticism though. I had the same problem with a few of my newer videos with my newer wide format camera. All it needs is a small tweak to the settings in the editing/conversion program before putting on YouTube. Thanks for posting those, Jim. I had no idea Bryan was working on an 03 sound set. Running qualities on the new chassis look to be very smooth too. I must email Bryan and see how he is getting on. Hopefully he will have made further progress with the 4CEP sounds as well. 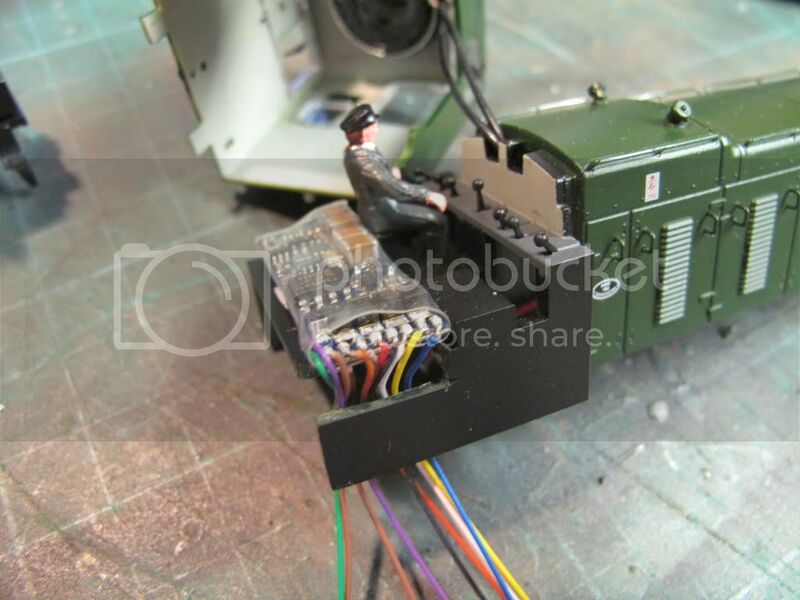 I was looking at fitting a sound chip in the 03 but initially couldnt see where there was a suitable space without some chasis cutting so I fiited a standard Bachmann 6 pin decoder for the time being. How did you fit your chip? The sounds are good and the video is lovely and clear. The only change I'd suggest is to the video aspect ration as they are currently coming out tall and thin - please don't take that as a criticism though. we noted that when we played them back, i recorded them in 16:9 so the next lot i will change the aspect on the camcorder. 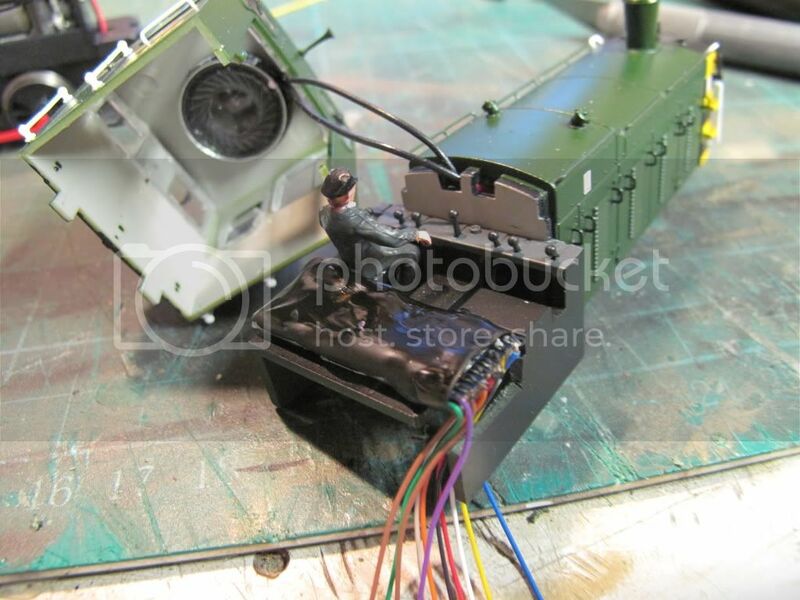 Firstly I removed the body then took the cab off, I then cut away the rear 1cm of the plastic floor of the cab. 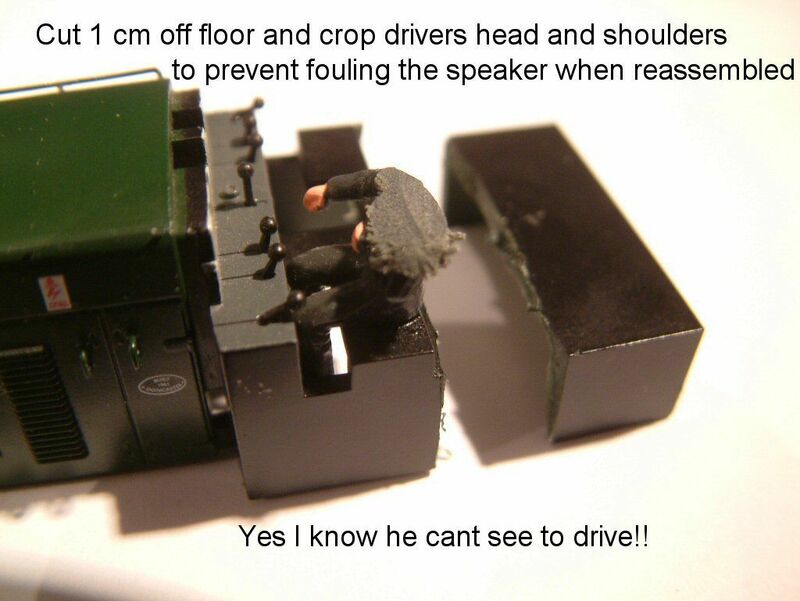 I mounted the micro speaker in the roof in blacktak facing down, cut the head and shoulders off the driver to stop it fouling the speaker! 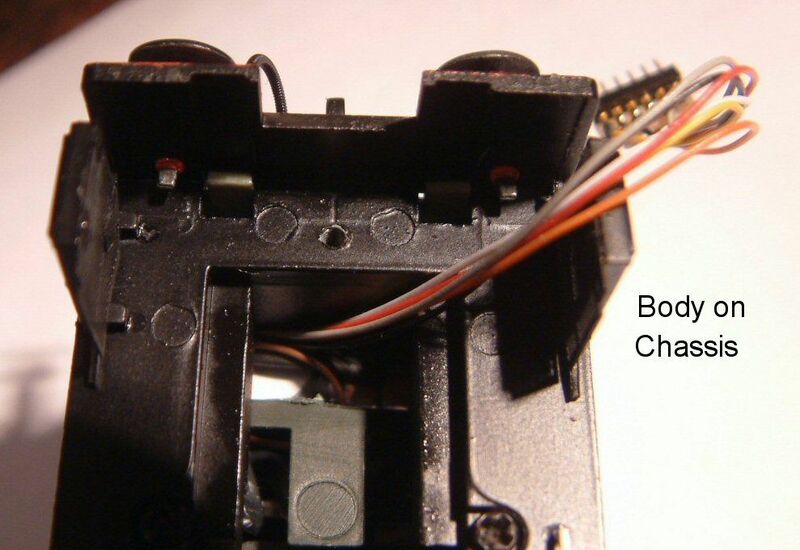 carefully trimmed the plastic off the non wired end of the decoder so it was level with the end of the circuit board, then I snipped away the plastic on the wired end so it was again level with the end of the circuit board, this just allowed the decoder to sit flat across the cab as a tight fit between the cab sides behind the driver. 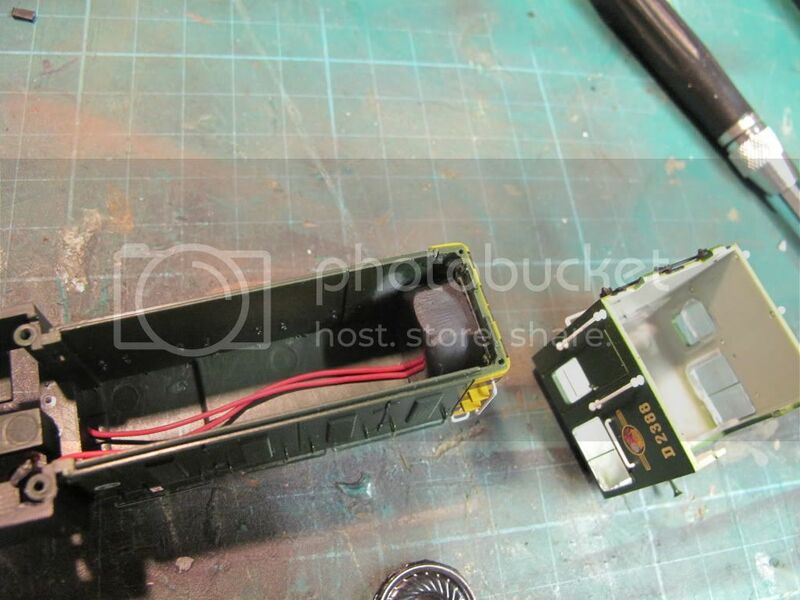 I then took the drivers window out and cut off the lower half, reglued the top piece back in so it was in the window down position to allow the sound out, doing both sides would be even better I suspect, I then replaced the cab on the body with the wires hanging down through the cut away floor area, the 6 pin connector was then plugged into the socket and the wires tucked tidily under the floor when refitting the body on the chassis. Not a bad sound level for a micro but most importantof all as the speaker was sealed in the cab with the blacktak the sound from it was louder than if left in free space or not in a chamber. It took me about an hour as it was a first effort, no soldering required. I did not look to see or test the cab lights working before the install and although they should work on F0 under DCC, I could not see them after fitting the decoder, probably because the led and mini circuit board is hidden inside the blacktak holding the speaker, so not seeing the cab lit may well be a compromise for a sound fit. 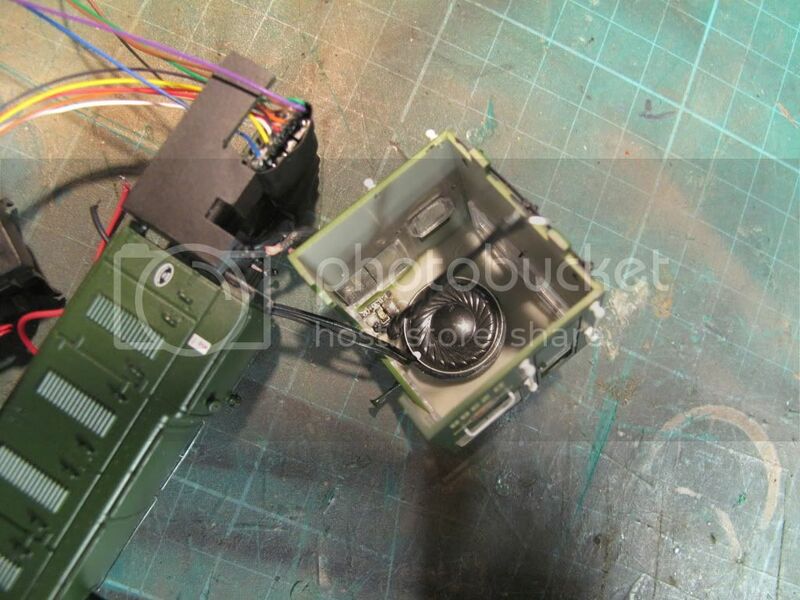 I wasnt too worried about the lights to be honest more about if I could get the decoder and speaker fitted in. quite surprised myself!!. Sorry I didnt take pics, but at the time I wasnt sure if it would be successful. I must add that although the 03 runs well from the box, it needs to be run in as per the instructions, and due to its short wheelbase and weight the wheels and track need to be squeaky clean, as Jim and I found out yesterday. here are a few more vids of the 03 and castle as well as the peak. anyone who's interested heres how bryan fitted up the 03, hopefully it may be of use to anyone who wants to give it a go! The large ejector is built into the sound file so that it is automatic and therefore more prototypical than asigning a function key. nice to see it was picked up on, makes adding these little subtleties worthwhile and hopefully enhances the sound project. Thanks for the pics. As an alternative I was going to investigate taking out the light completly and getting rid of the excess wire and resistors to see if the chip will fit above the motor. I've been using the info from Bryan to see I'll be able to get sound in my 07. The new 03 chassis fits my Silver Fox/Craftsman mongrel and I can see I'll be able to get the decoder into the cab roof. I need to see which speakers may best fit a 25mm x 15mm width x 10mm depth space in the ready louvred bonnet. 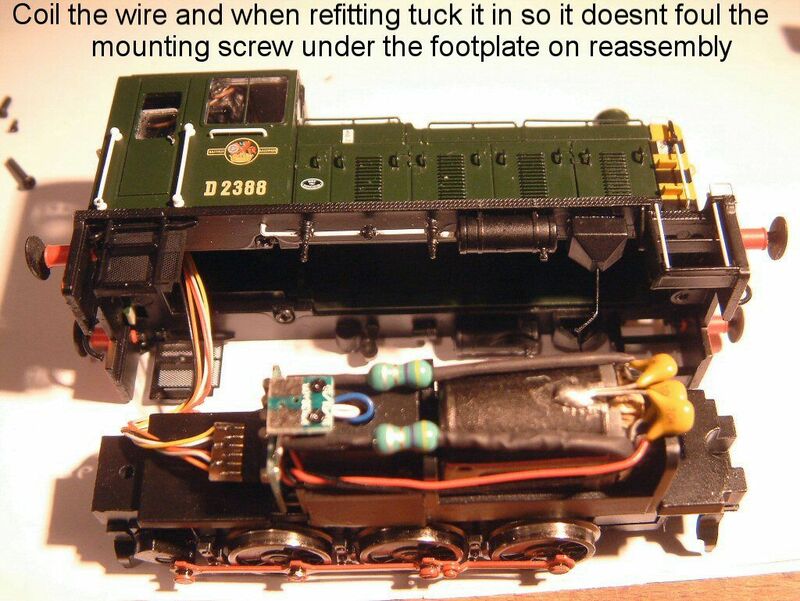 I thought this might be the thread for my sound fitted Class 03 diesel shunter video on YouTube. This is the first time I have allowed an Internet view of any of my sound projects. There are a lot of extraneous noises and, if you read the notes on each file, all will be explained. both of these sound project are very well done, must a some point get a sound chip for my 03, all tho the last 2 sound need to be s BR stanard 4 tank and a schools class! thats it for the club sound layout! very well done! You an see from this picture that the cab isn't sitting back down correctly, you can see the gap at the back. This is because the decoder is fowling on the window mouldings. 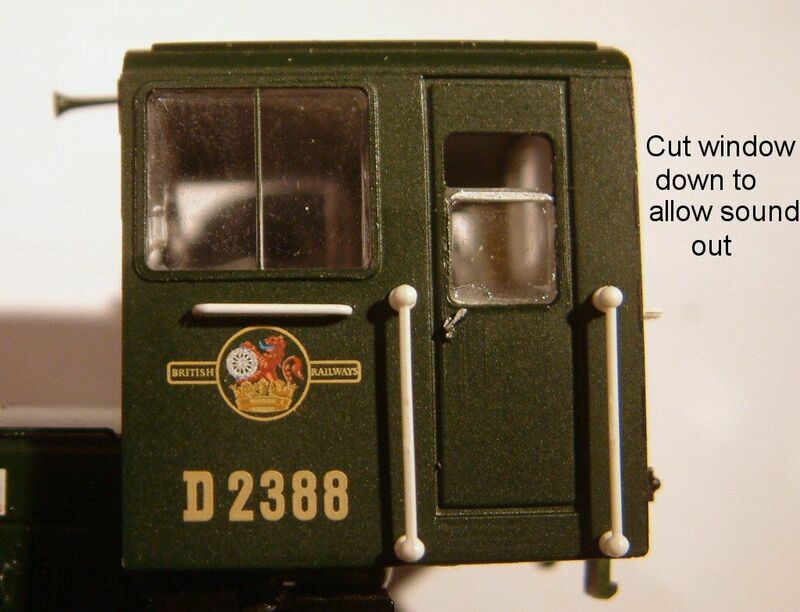 The simple solution to this is to firstly remove the cab door windows, and cut/shave/trim the bottom, then re-assemble and you'll find it sits flush correctly. 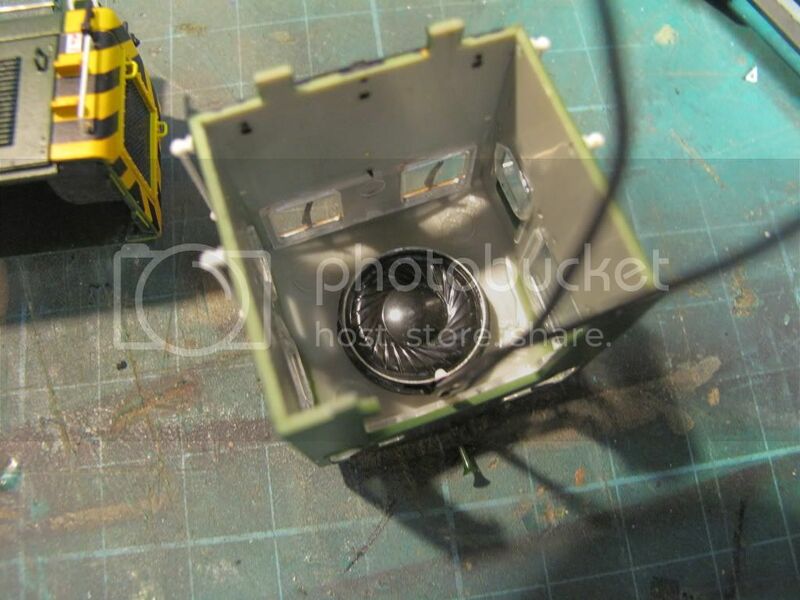 The other thought that I don't think anyone has picked up on, is to use the twin 16mm round speakers (50447), if you remove the black panel from behind the front grill, you get left with the etch and holes. 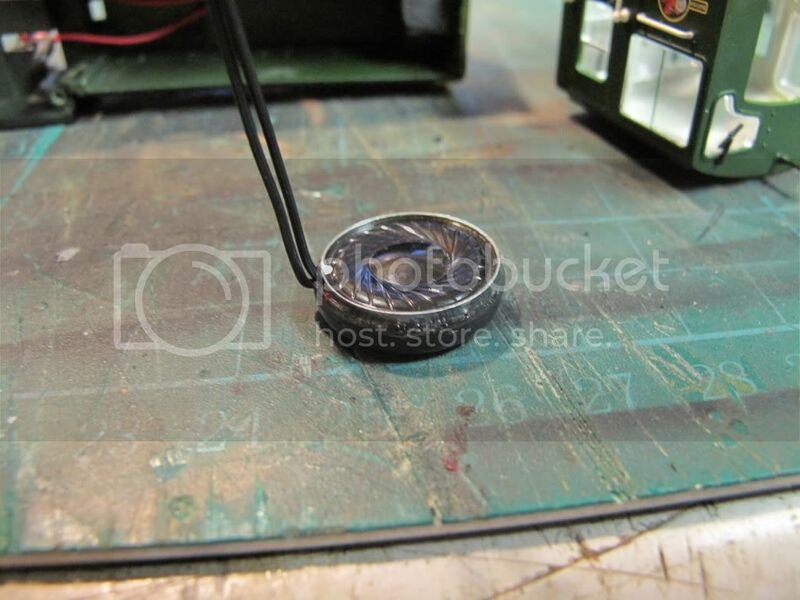 Behind this you can mount one 16mm speaker in its enclosure quite happily, you will also need to fit the second speaker to get the correct loading of 100ohm, this will go just behind the contacts for the cab light. It sounds quite good, with the noise coming out of the bonnet and not the cab, although most drivers will tell you the cabs were pretty noisy anyway. Thanks for the info, I will look at it, one of the tabs broke off and I know I it needs to be tidied up. 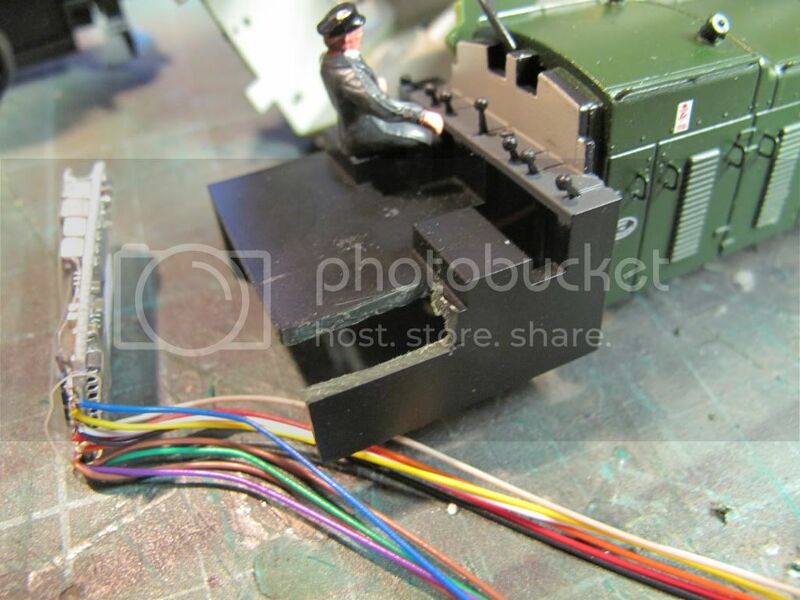 Jim - Anyone, Where can you buy the 'Blacktack' stuff from. Nine sounds on the 03.
i got mine from focus diy, the one in crewe shut last month but i think the nantwich one is still open!! Cheers Jim, Im off to Focus. I would be interested to know if this is a new castle recording or the same one as listed in the catalogue. I had one of these chips about three years Ago in oo and wasn't that impressed.didn't have sleeper groan guards whiste etc, This vid sounds good and I want an O gauge version sometime in the new year. btw	anyone know wot the max volume is for 2 16mm speakers ? 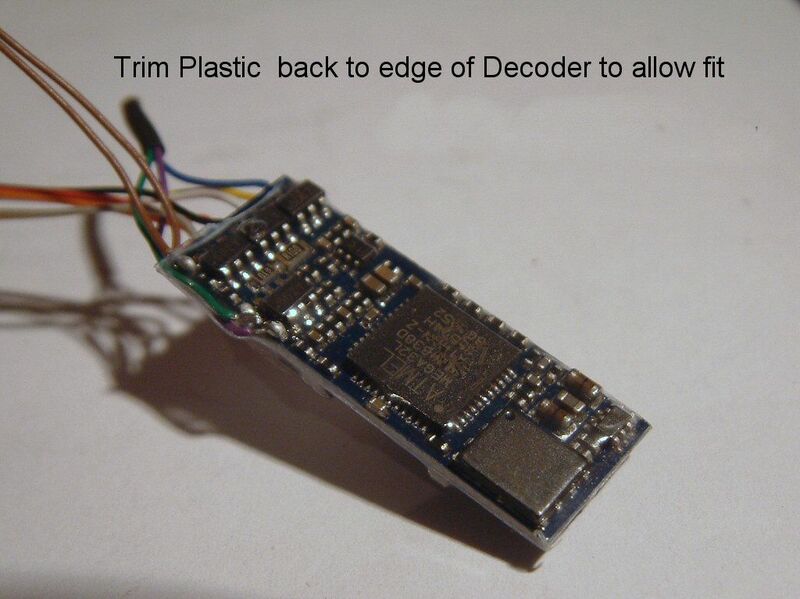 This really should be on a new thread as is about fitting a Zimo sound decoder but I thought it would be of interest. 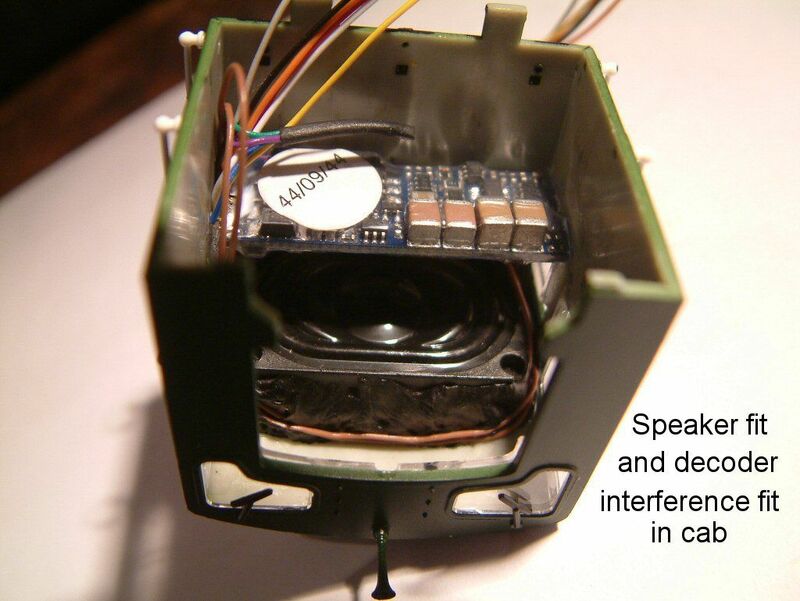 I have used one of the small CT Electronics speakers which are remarkably loud for the size, it fits perfectly into the slot underneath the cab designed for decoder. 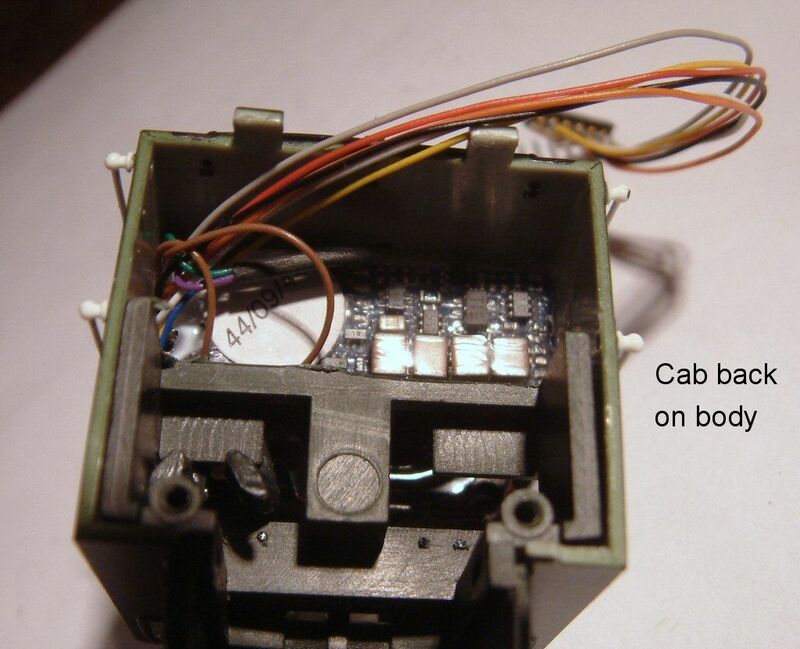 I have hard wired the decoder and removed the cab light. 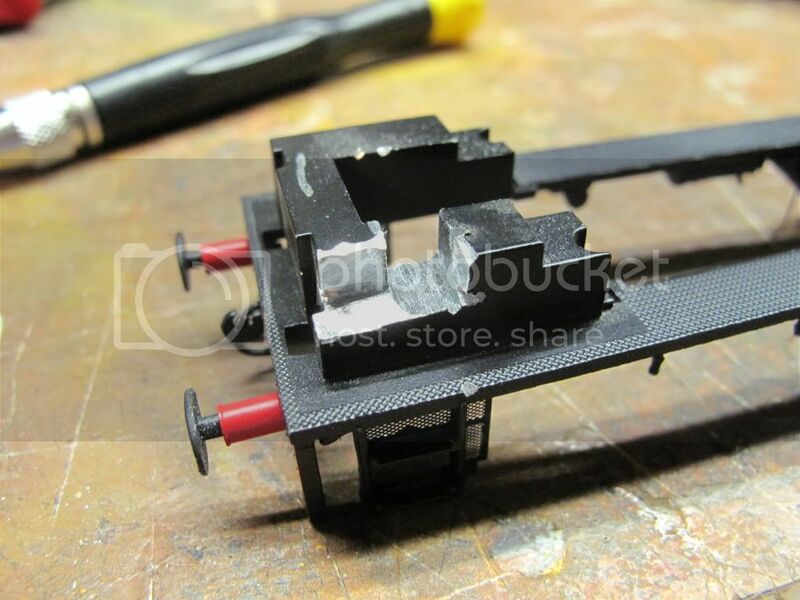 this is very interesting, I wasnt aware of sound in such small 4mm locos.